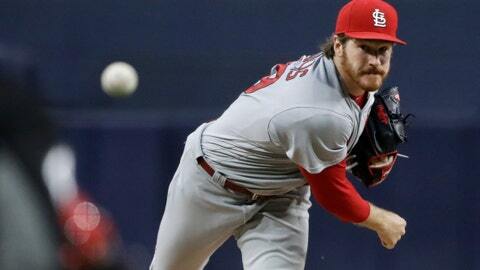 Miles Mikolas allowed only one run and five hits over 6 2/3 innings. SAN DIEGO — After three seasons in Japan, pitcher Miles Mikolas is making a strong first impression with the St. Louis Cardinals. “He’s performing at an All-Star-caliber level right now,” teammate Tommy Pham said. Mikolas won his fifth straight decision to begin the season and Pham homered in his return from a groin injury, sending the Cardinals past the San Diego Padres 2-1 on Thursday night. And though Mikolas issued his first walk in three games, he allowed fewer than three runs for the fourth consecutive start. “He did exactly what we needed him to do,” Cardinals manager Mike Matheny said. A home run by Raffy Lopez chased Mikolas in the seventh and was the only extra-base hit against him. “It was just another very good game from Miles,” Matheny said. In 27 outings with San Diego, all in relief, Mikolas had a 3.44 ERA. He was better known then for having eaten a live lizard, on a dare, as a Padres minor leaguer. The moment, which was posted on YouTube, earned Mikolas the nickname Lizard King. After he was traded twice, the Texas Rangers tried him as a starter. He had a 6.44 ERA in 10 outings. Mikolas decided he needed to go where he could pitch with a longer leash. He joined the Yomiuri Giants and reported improved command after returning to the United States and signing with the Cardinals, where he has partnered with former Rangers pitching coach Mike Maddux. Against the Padres, the right-hander’s repertoire included a mid-90s fastball, a changeup, a split-finger changeup, a hard curveball, a rare slow curve and one quick-pitch delivery. “I tried to sneak some things in there,” Mikolas said. Mikolas said he owed much of his success to the team’s defense. Pham, who had missed four games, singled and scored in the first inning on Jose Martinez’s sacrifice fly and homered in the fifth for the Cardinals’ only extra-base hit. Both hits came against Jordan Lyles (0-1). “I’m still working on getting to where I was,” the center fielder and leadoff man said. Instant replay confirms: Thou shalt not run on Marcell Ozuna. After each of Cordero’s singles, Mikolas retired Chase Headley, once on a double-play grounder. “I was thrilled with Jordan,” Padres manager Andy Green said. Pham’s sixth home run, off a hanging breaking ball in the fifth, was a 371-foot line drive over the left-field wall. Cardinals: Placed ace Carlos Martinez on the 10-day disabled list because of a strained right lat. The right-hander leads the National League with a 1.62 ERA. RHP Mike Mayers was recalled from Triple-A Memphis. Padres: San Diego catcher Austin Hedges was sent to Los Angeles for tests on his throwing elbow. Cardinals: RHP Luke Weaver (2-2, 5.50 ERA) has given up at least four runs in each of his last four starts. Padres: LHP Eric Lauer (1-1, 5.79) will make his fourth career start. Last time out, he earned his first win with six scoreless innings against the Dodgers in Mexico.